Planning for developing a PHP web application nowadays also includes choosing the right framework. PHP frameworks have become increasingly popular and rightfully so. They can save huge amount of time with coding. Some of them are easy to learn and use, even if you don’t master OOP programming. Using a framework also takes care of important things like security and easy update of your own code and all other packages. Some frameworks have a huge and active user base and community, making it easy to look for help and solutions if you get stuck. PHP latest version, 5.3.5 brought many changes which made some of the framework malfunction. Most of them now do support PHP 5.3.5 while others have rewritten their whole code base. I selected 7 of the most used frameworks and listed them here with key features and some accompanying weblog entries by people with user experience. My personal preference from past experience is CodeIgniter, but the brand new released FUEL sounds very promising. Fuel is a simple, flexible, community driven PHP 5.3 web framework based on the best ideas of other frameworks with a fresh start. FuelPHP for CodeIgniter Developers A weblog entry from a former CodeIgniter user about FUEL. 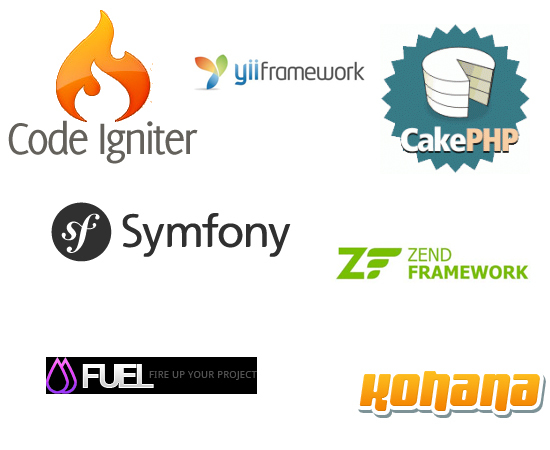 CodeIgniter vs CakePHP An old yet still worth to read weblog entry. Kohana is an elegant HMVC PHP5 framework that provides a rich set of components for building web applications. Zend Framework is based on simplicity, object-oriented best practices, corporate friendly licensing, and a rigorously tested agile codebase. Makes use of commonly available API’s like, Google, Flickr, Amazon, etc. Symfony is a web application framework for PHP projects.